James Myatt is executive chairman at Townscape Products. The company has over forty years’ experience providing counter terror systems for towns and cities in the UK and overseas. Here he discusses the latest developments in hostile vehicle mitigation and how architects, town planners and specifiers can protect people from an evolving and growing threat. In the 17 years between 1996 and 2013, there were only ten reported incidents of vehicles being used as an offensive weapon. Tragically, since 2014 there has been a rapid escalation in this form of violent crime with Vehicle as Weapon (VAW) attacks increasing to an average of ten per year. Particularly worrying is the fact that more than 20 attacks occurred in 2017 alone. Most attacks have targeted major European cities with dense populations and familiar landmarks that provide easy access for vehicles. The terrorist organisations and extremists responsible have identified obvious weaknesses in the infrastructure of these cities – typically, wide open pedestrian spaces that leave people vulnerable to VAW attacks. Although this type of attack requires little planning by the perpetrators, the consequences are catastrophic. So where does responsibility for the public’s safety lie? I believe that the duty of care rests with the site owners and that they have a duty of care to ensure their urban landscape is properly equipped to counter an attack. Striking the balance between installing robust counter terror measures while upholding the appearance of a relaxed urban environment remains one of the biggest challenges our industry now faces. While it is important to maintain a sense of normality – nobody wants to live, work or play in an area that looks like a war zone – it is imperative to protect people. Strides are being made, helped by government and industry actively to promote greater awareness of hostile vehicle mitigation (HVM) systems. The term HVM is synonymous with counter-terror prevention and anti-crime measures. Put simply, it’s a system of permanent or temporary perimeter security products designed to defend people or property from VAW attacks. HVM systems make safe open spaces, assets and activities by managing vehicle access by the strategic placement of products that block access to restricted or pedestrianised areas. Made from robust materials, these products – be they counter-terror blocks, PAS 68 bollards, PAS 68 vehicle barriers or planters – can literally stop a vehicle in its tracks. Most HVM systems are installed near busy pedestrian areas or around the perimeter of buildings that experience significant footfall, such as airports, railway stations, embassies, hospitals and national landmarks. Should defences look like deterrents? Even murderous evil-doers are not necessarily stupid. They know that if a truck hits a large block of concrete, it will come to a halt. This begs the question of whether we should make it obvious that our public spaces are defended in order to deter attacks or should we attempt to disguise our protections in a bid to allay public fear. Fortunately, providing robust security without scaremongering can be achieved. Covert HVM is designed to be inconspicuous and go under the radar of the average passer-by or bystander. Although it is virtually unnoticed, it provides protection without visually impairing the landscape. Aesthetic design and clever use of materials and surfaces can make products look inviting – often enhancing their surroundings. In short, covert HVM provides protection without telegraphing its real purpose. 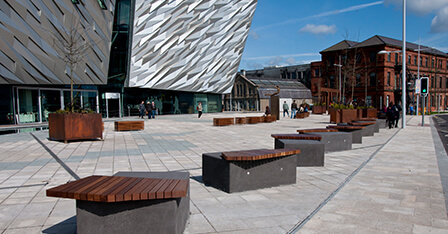 It can come in the form of seats, planters, litter bins or even cycle racks – all of which can be produced to PAS 68 specification. With covert systems, a range of products are often used to break up the urban environment to make it less penetrable. Something as inconspicuous as a cycle rack can serve the purpose of stopping a vehicle from gaining momentum. Covert systems are particularly suited to public facilities such as schools and universities, arenas, courts and office blocks – areas where pedestrians need to be kept safe as they go about their day-to-day business without constantly reminding them of the potential risks of doing so. Conversely, Overt HVM is designed to act as a blatant and imposing visual deterrent to potential assailants. Often marked with high-visibility black and yellow hazard lines, their purpose is to boldly demarcate pedestrian zones and discourage attackers by clearly displaying the fact that the area is protected against vehicle attacks. The array of concrete blocks diverting traffic away from the world-famous facades of Buckingham Palace leave nobody in any doubt that the perimeter is virtually impenetrable to vehicles. Temporary event perimeter security (TEPS) is the latest development in the industry and we have used our 40+ years knowledge and experience of permanent HVM design and strategy to develop a market-leading range of products. Suitable for events that attract large crowds, such as Christmas markets, sport and music events, religious festivals and fairs, TEPS give event organisers, local authorities and the Police confidence that their event will be safe from attacks, while also providing reassurance to the public that they are safe. Unlike permanent fixtures, these measures can be installed and removed in a matter of hours, with minimal disruption. The recent targeting of temporary events has called for bold measures and event organisers must now consider overt systems as a way of reassuring the public and deterring fanatical and fearless assailants. A security consultation is recommended in advance of an event to define the perimeter, assess access points and areas of vulnerability, and discuss logistical issues surrounding the event. The recommended solution should protect the boundary of an event without stopping the flow of high volumes of pedestrian traffic. It is perfectly possible to achieve a high-level of security without detracting from the event itself. At Townscape we offer a range of standard and bespoke covers for certain products which help enhance the atmosphere at an event. Unfortunately, we live in an age where HVM is now a mandatory consideration. It has long been considered an irrelevance by planners, specifiers and architects. Misconceptions about the image and cost of security products have meant that their importance has often been overlooked. However, options now exist that allow an area to be protected without destroying its aesthetic and social merits. As for the cost of protection, what price a life? A team of highly experienced advisers at Townscape Products work with local authorities, the police, town planners and architects to protect towns, cities, buildings and events. They can be contacted for an informal discussion on 01623 513355.